Just like every other part of your wedding planning, the music you’ll include during your ceremony usually represents a compromise between what you want and what your fiance wants. In order to share with you what I’ve learned about selecting music for your wedding ceremony I have put together the following list. Along with the other information you may need. A simple Google search of any song listed below will bring many results, another good option is YouTube. Below is an explanation of the parts of a ceremony and some music suggestions. Please ask if you’d like a microphone to be available at your ceremony. Your music choices are not limited to what is contained herein. Please ask if you would like additional help choosing music. Your music choice is only limited to your creativity. This is the part of your ceremony where the guests are being seated and waiting for the ceremony to begin. Songs 1 to 15 are appropriate for this part, both traditional and non-traditional. Choose five for this part, and order your Prelude with your favorites at the end. This is the part when your Bridal party comes down the aisle. You may choose any one song from 1 to 15, for this. The most traditional choice is song 16. The processional includes the Bride too, and you should pick a separate song for her. The most time-tested choice is song 16. 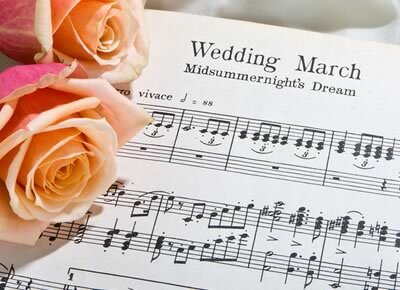 The Bride may want song 16 for herself, in which case the Prelude music will continue as your bridal party heads down the aisle, and song 16 will be cued for only the Bride. When the ceremony ends, you may choose the music that plays when everyone leaves. Songs 17 to 20 are traditional options. Song 17 is the most popular. You should pick two songs for the recessional, either from songs 18 to 20, or 1 to 14. Once we receive a contract for your Wedding Ceremony and/or Reception we will send you a link to our Online Planner for your event. On these Planners you can select all of your music choices. If you need help choosing another song, we will do our best to assist you.